William Faulkner is revered as one of the finest American novelists of the 20th century, a master of intricately constructed stories and sentences requiring the reader's concentration but unfailingly repaying that effort. His most famous novels include Absalom, Absalom!, a complex story of one man's journey from rags to riches to ruin; As I Lay Dying, about a woman's desire to be buried near her childhood home, instead of the scene of her disappointing adulthood; Light in August, about a woman's difficult search for the father of her unborn child; and The Sound and the Fury, in which an idiot, a suicidal student, their brother, and the novel's author present four perspectives on a family of faded Southern aristocrats struggling to deal with their lowered position in society. 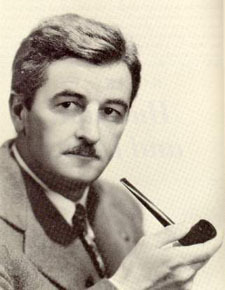 Faulkner was mentored early in his career by his friend Sherwood Anderson, who advised him to write about the Mississippi turf he called home and knew so well. His great-grandfather had been a regional railroad baron, and the family had once been wealthy, even owning a sizable plantation, but by Faulkner's birth the ancestral fortunes had been diminished to almost nothing. He wrote 15 novels set in the fictional Yocona County (later renamed Yoknapatawpha County), a region of Mississippi clearly based on his native Lafayette County. He began writing poetry as a teenager, quit high school at the age of fifteen, and never earned a diploma or degree. With the outbreak of the First World War he wanted to fly with the US Signal Corps, predecessor to the present day US Air Force, but he was too short to qualify. He later went to Canada and joined that nation's Air Force, but the war ended before he had completed his training. Still, he occasionally claimed to have been shot down over France, and parlayed his veteran status into admission at Ole Miss, where he lasted three semesters before dropping out. Falkner was his family's name, and he gradually changed the spelling with an added "u", using both forms of his surname interchangeably over the early years of his writing career. Beginning in the mid 1930s he often stayed at Wright's Sanatorium, a facility in the town of Byhalia, Mississippi, not far from his home. There he could safely recover from the extended but planned-in-advance drinking binges with which he celebrated the completion of each writing project. By the 1940s Faulkner was a published and respected author, but even his best works did not sell particularly well in America, and he was better known in Europe than his native country. With the exception of the rather tawdry Sanctuary, his books' press runs and royalties were small. He supported himself through working numerous jobs, including stints at a book store, as a local postmaster, and on the night shift at an electric powerhouse. He also wrote and repaired scripts for the Fox, MGM, and Warners studios in Hollywood. His best cinema work includes movie adaptations of Raymond Chandler's The Big Sleep, Ernest Hemingway's To Have and Have Not, and George Sessions Perry's The Southerners (though the latter work was uncredited, since it was not for the studio that held his contract). His odd jobs and Hollywood work ended after he won the Nobel Prize for Literature in 1949. For the rest of his life he was a celebrity, though by then his best work was behind him. His great-grandfather, William Clark Falkner (the railroad magnate) was also a successful novelist, best known for The White Rose of Memphis, a murder mystery that was extremely popular in its time. Young Faulkner never knew his great-grandfather, who was dead before Faulkner was born, but he read his books and admired his ancestor, whose life and character served as inspiration for Faulkner's fictional John Sartoris, who appears in two of novels and several of his short stories. Faulkner himself was fictionalized in Joel and Ethan Coen's film Barton Fink, with aspects of the author represented in the characters played by both John Mahoney and John Turturro. Like the Coens' fictional Fink, Faulkner's first screenwriting assignment in Hollywood was a wrestling picture starring Wallace Beery � MGM's 1932 film Flesh. The plot of that film has Beery's character winning a wrestling championship in Germany, but shady operatives behind the scenes want him to intentionally lose a big match. Faulkner did not receive screen credit. In the question and answer session after a 1947 lecture at the University of Mississippi, he was asked his opinion of Hemingway's work, and responded, "He has no courage, has never climbed out on a limb ... has never used a word where the reader might check his usage by a dictionary". When Hemingway read a newspaper account of Faulkner's remark, he took offense at the phrase "no courage", and had a colleague write to remind Faulkner that Hemingway had been a correspondent at the war front. Faulkner apologized (if it can be taken as an apology), explaining that he meant only to criticize Hemingway's courage as a writer, not his general manhood or bravery. For his part, Hemingway once critiqued Faulkner's work, stating, "I can tell exactly when he gets tired and does it on corn (e.g., bourbon or whiskey) just as I could when (F.) Scott (Fitzgerald) would hit it..."
At the age of 64 in 1962, Faulkner suffered a fatal heart attack during one of his recuperations at Wright�s Sanatorium. He was buried at St Peter's Cemetery in Oxford, Mississippi.